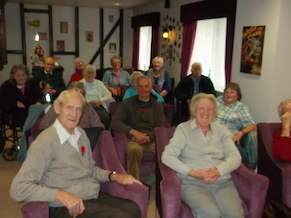 We piloted some dementia-friendly screenings at Suffolk venues a couple of years ago and since then we have received regular enquiries. We're delighted that dementia-friendly screenings are still taking place at the venues originally involved in our pilot activity and we're here to encourage and offer support for more screenings - so if you have a venue or an event in mind, do get in touch. We think it's really important that we promote inclusivity for those living with dementia and their carers - and that they don't feel excluded from arts and cultural venues. Dementia-friendly screenings are open to anyone but as there are subtle changes made for these screenings (breakout spaces available, potentially lower light and noise levels) they are fully accessible for those living with dementia. Our thanks to Big Lottery Fund and West Suffolk Community Chest for their support with these screenings!